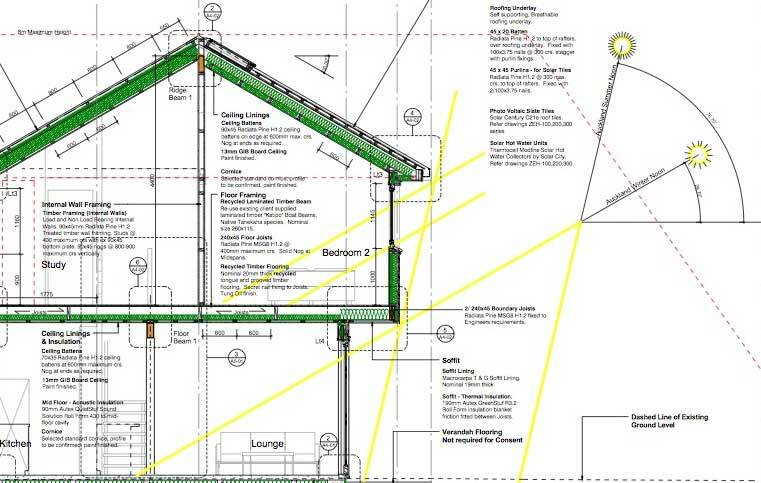 The Solar Access page presents the design options and decision made with regard to maximising solar gain through building placement and room configuration. Financial. While some of the construction costs a little more up front, eliminating heating systems and the need to operate, maintain, and replace them over the next 25 years makes passive heating a cheaper option in the long-run. Comfort. One issue with relying on mechanical heating systems for a home is that temperatures can be variable within the home. For example, heating systems might keep the living areas warm but then at night people retreat to bedrooms that are cold overnight. Designing a house to be warm throughout without heating eliminates these cold spots. Solar access. The building has been located and orientated on the site to make the most of the site-specific sun angles. The internal layout of rooms has also been planned around which rooms need sun in the morning (kitchen), throughout the day (living areas), and evening (bedrooms). Heat is captured during the day and released overnight via a concrete slab thermal mass on the ground floor. Windows. Most of the glazing is on the north side of the house to optimise daylight and solar gain, with glazing on the south side is minimised to reduce heat loss. Walls. Heat is retained in the building through both high-performance glazing and a double layer of insulation, which takes the building to 50% above building code thermal performance. Designed shading minimises overheating in summer and maximises solar gain in winter. Shading is used to control solar gain into a building as and when required, typically in the summer time but also in the shoulder seasons. Without shading internal temperatures can reach uncomfortable levels, so shading needs to be considered along with ventilation for optimum temperature control on warm days. In summer the mid-afternoon western sun is the most warming and therefore in our house design we have kept western glazing to a minimum. In winter the early afternoon western sun is the most warming and in our house will enter through the northern glazing (as the sun trajectory in winter is further to the north). Corner fins to reduce some of the eastern sun on the northern elevation. Cross section illustrating use of overhang on the north side to control solar gain in winter (lower sun angles allowed to penetrate to heat the internal concrete slab) and summer (high sun angles blocked by the overhang). We are also considering sliding shades along the north elevation that can be extended, contracted, or moved as required, and vegetative shading on the eastern elevation to help reduce low level sun during the summer months. These shading features will be developed when we have lived in the house for a year and have a good idea how it performs in the summer. Whilst a computer model can be used to do this it cannot tell you what conditions you find comfortable. 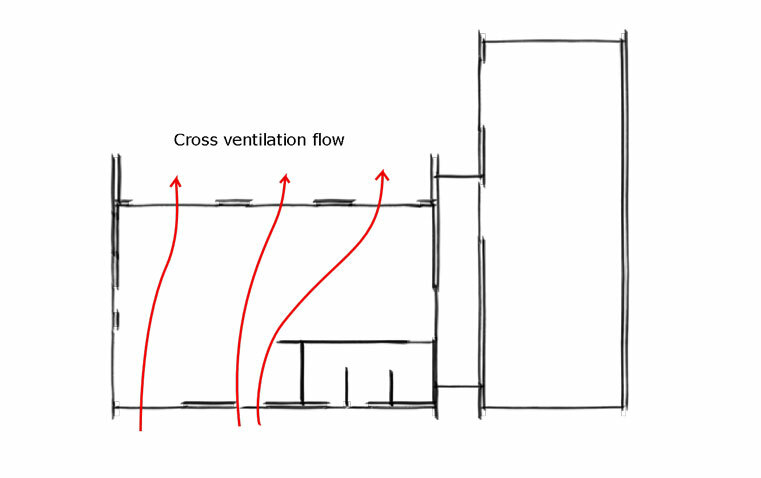 Planning natural ventilation at the design stage avoids the need for costly ventilation systems. It removes unwanted heat from internal spaces on warm days. The movement of air over skin also helps to keep people cool. It helps to provide fresh air to a space and remove stale air. Building and furniture materials emit chemicals into the air which can be harmful to human health. Ventilation helps to remove these chemicals from the house. It also helps remove moisture from the house - from cooking and showers, but also from people. Our design decisions on ventilation of the house were covered in the Passivation blog post. We decided to keep the ventilation simple but effective and use natural ventilation throughout with mechanical ventilation in high moisture areas such as bathrooms (extractor fan) and kitchen (rangehood). Opening windows on opposite sides of the room where possible to allow cross-ventilation. Windows to on the north and south elevations allow cross ventilation through the main spaces (image shows ground floor). Secure opened windows allow ventilation throughout the day, avoiding overheating and a stuffy house in the evening. For natural ventilation to be effective we've had to think about how we use the house. This is fairly easy for most of the year, but needs a little more consideration for the winter to maintain reasonable internal temperatures. For example, opening the windows when there are high internal gains (like when you have all your mates around or are cooking a big dinner) or on the morning of a sunny winters day when there will be sufficient solar gain to reheat the house. Turning on the mechanical ventilation system as soon as moisture is produced, e.g., turning on the kitchen rangehood when cooking or the bathroom extractor fan when having a shower. Keeping steaming cooking pots near the kitchen exhaust. Opening windows in the kitchen when steam is being produced away from the kitchen exhaust, for example when pouring hot cooking water into the sink or washing up.